Getting family photos taken? 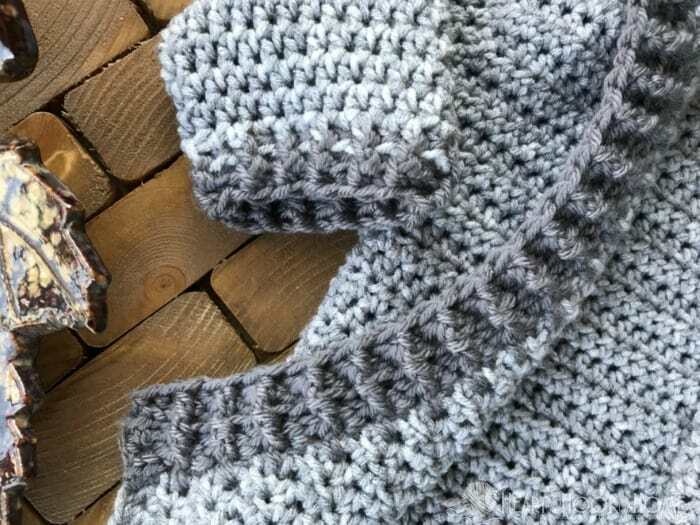 Make one of these cardigans for each of the kiddos! 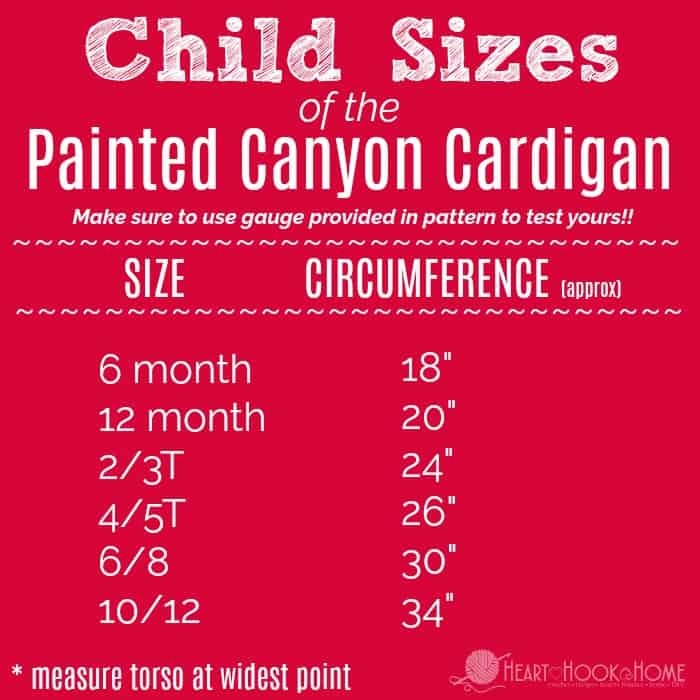 This pattern is for the 12 month infant hoodie, but the same concept is what I’ve used to create all sizes that go up to 28W! If you’d like to watch me make a similar size you can watch that video of me making one here. Note that I do not give you stitch counts as there are now 15 different sizes of the pattern. The video is not a complete tutorial, rather it shows how to control the colors, how to construct the shoulders and start the hood and the basics of the pattern for all sizes. Note! 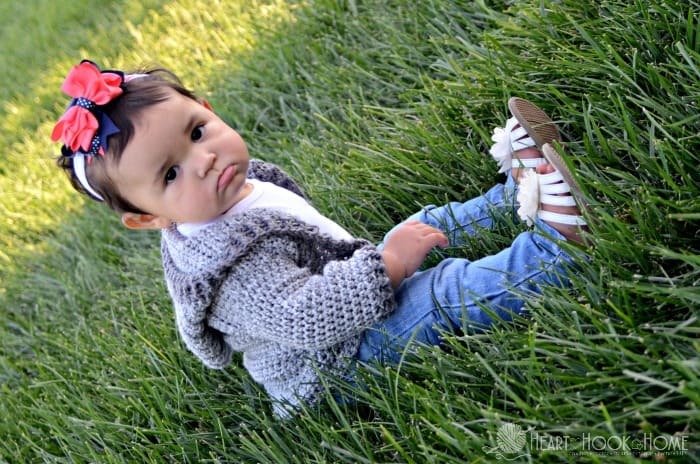 If your baby is on the chunky side (my favorite! 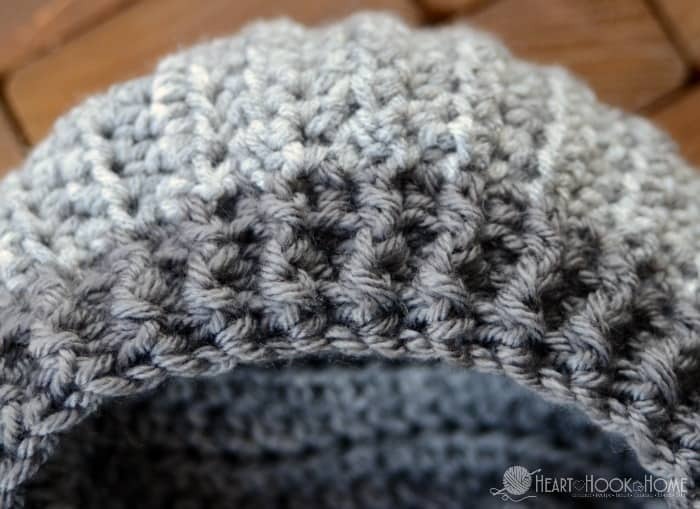 ♥) you might try the 2/3T pattern instead using a smaller hook (5 or 5.5 mm). Use stitch markers and mark 15 sts in from each side to start armholes. Fold front sides in and line up the edges of the top to sew the shoulders. Starting at the outside, sew front to back using the Mattress Stitch for 9 sts on each side. This will leave 9 unsewn stitches on both fronts and 10 unsewn stitches along the neck for a total of 28 stitches. Fasten off leaving a long tail for sewing. Fold right sides together and sew the top of the hood. Row 1: Ch-1, hdc in the end of each row up to hood, around the top edge and down the other side making sure to place just one hdc per row. Row 2: Ch-1, * fphdc in next, bphdc in next * repeat between ** around to end. Rows 3-4: Ch-1, fphdc around previous row’s bphdc ( to create ribbing), bphdc around next fphdc. * fphdc around next, bphdc around next * repeat between * * to end. Weave in tail. Remember that if you have a chunky or taller baby, you may want to work the next size up with a smaller hook than recommended. I did enlarge this 12 month infant hoodie pattern from the original draft because many 12 month olds have some chunk! Should you have any questions, don’t hesitate to shoot me an email or a message, and I want to see your finished projects!! 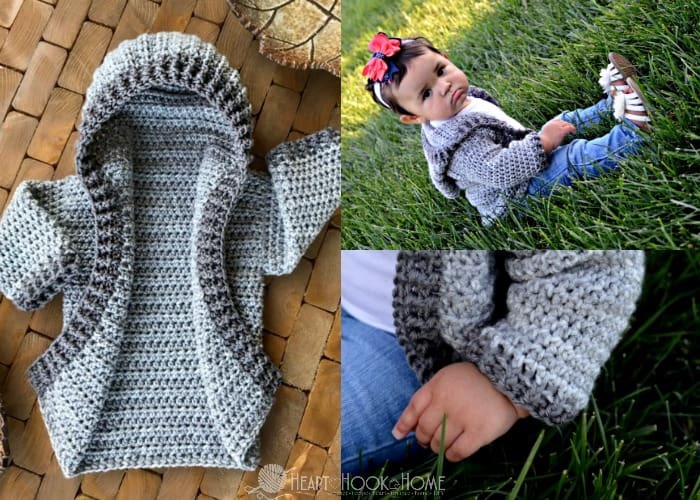 Share photos of your 12 month infant hoodie with me by tagging @HeartHookHome on Instagram and Twitter, and by sharing in the Heart Hook Home Crochet Community group on Facebook! And the ADULT pattern (sizes currently up to 24W) is available here. I’m wondering why in this pattern, the front panels are wider (15+15) than the back (28) and in the 6 month pattern, they’re shorter? (11+11) and 26? Hi Ashley! It all has to do with the hood...since there's not much of a difference in back width between the 2 sizes, we need to make the front panels a little wider on the 12 month size to give enough stitches for an adequate sized hood. Hi I made the unicorn hoodie for my daughter and loved it. I'd like to make one for my younger daughter who is 7 months. A friend bought me the bernat pop yarn and am hoping to use that with a size 8 hook as it requests. Should I do the size 12 pattern knowing it will be bigger or use a smaller hook size with the bernat yarn and do the size 2 pattern? Please help. Hi Mandi! The Bernat Pop recommends an H/5 mm hook, while the pattern calls for a J/6 mm hook...I would probably go in the middle and use an I hook with the 12 month pattern. Hope this helps! I am new to crochet and this is the first garment I have ever made ... and I have screwed up. I picked a size that is slightly too small. Is there a way to add a little width without starting all over again? Hi Deb! 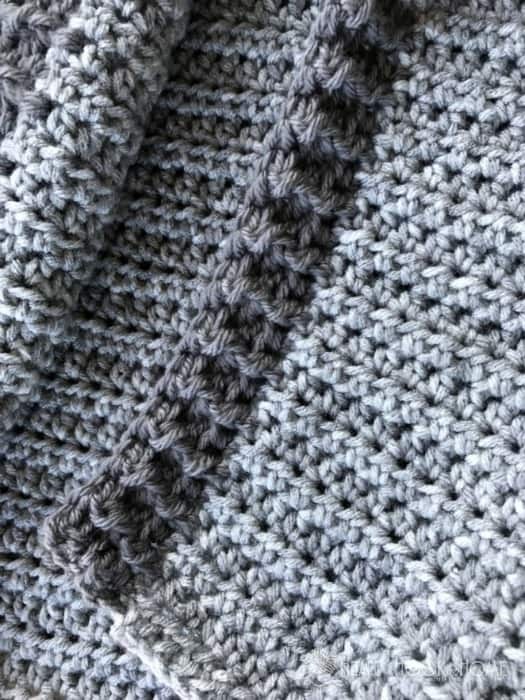 You can add some width the front by doing a few more rows of edging. Hope this helps! Hi Susan! It sounds like your measurements are spot on...and the increases on the left and right panels are simply to give more of a lapel for the hood to be attached to...babies tend to have proportionately larger heads, so we added a few more lapel stitches on the 12 month size to give a little more hood room. Hope this makes sense and helps! If the beginning is 56 hdc how can it then be 15 on each side (30) and 28 in the middle. Am I missing something? Hi Barbara! The stitch marked stitches will have 2 stitches in each, giving you 2 more sts total for the row. Hope this helps! Dear Ashlea, I'd like to thank you for this pattern. I've just finished it for my 10 months old baby, and it is just lovely. :) I really admire your enthusiasm! Thank you once more, and I'd really like to share a picture of the sweater with you. Hi Eszter! I am so happy that you enjoyed the pattern! I would love to see it! You can email a picture or share on the Heart Hook Home Facebook page. thank you so much for this pattern! I just started last night , I can't wait to see the end results. thanks again for easy to understand instructions. I'm a newbie!! Hi Kim! I hope you enjoy the pattern! Good luck to you and happy crocheting! Could someone please explain what the increases are for on the shoulder section of the 12m size? I'm a leftie; when I fold this in the bump from the increases will be toward the center. Seems like this is going to mess up the edge and edging? Did I read things wrong and put them on the wrong end? Seems like they're correct, from the comments. Thanks! I really appreciate your video. I'm very hard-of-hearing, and talkies with no captions are such a waste. Yours was a refreshing change, and perfectly understandable without all the stuff I can't hear. Thanks. Please keep it up. I love the pattern, thank you so much. I have been wanting to make something like this but didn't know how to go about it. Again thank you. Thank you, thank you so much. this is exactly what I have been looking for. Hi there! As long as you use 3/4" buttons they will fit through any opening on the opposite side of the edging. Hope that helps! You could use a larger hook for the edging only, and that would suffice, I think. I started the 2T size with an I hook for my 1 yr granddaughter and it was way too big for her. I will put it away for when she gets bigger. I started the 12 mo. With a K hook and will see how that turns out. I also plan on making 3 more adult sizes since I really love this pattern. So simple and easy! What is the color of the trim on the grey marbled sweater? I need to order but don’t see the darker shade by Soft and Sleek Baby yarn. Thank you! I'm stuck at the hoodie with the 12 m pattern, shoulder attachment and count. It just isn't adding up. Hello I am doing the 12 months for my great grandson I'm almost finished with the sleeves it doesn't say when you switch to the edging color so is the last 4 rows the fphdc and bphdc for the edging on the sleeves ? I want to make this for a newborn. Would a size 3 baby yarn or mandala, hooked with a G or H, make it too small? I made a 6 month old one, no problem. Starred a size 2/3 and it ended up way to big. Inside from arm pit ended up 15" long and I need it to 9". Tore it all out, restarted, did the gauge. Thought I'd try a 12 month, he's 2, but he's very small. Used a size J hook, 11 stitched ends up at like 3". So then I used a "k" hook. 11 stitched ended up at 4", but when I got the 10 rows on it, it ended up at around 5 1/2". I'm so confused. I want to make one for my grandson, to match his little sisters. Absolutely love this pattern! I made the 6 month and am now working on the 12 month! Thank you! Is there a way to get a PDF of the pattern? I only have the internet aft the library or other free wifi area but would love to make this for my nephew. Sorry for the repeat, my phone isn't behaving... I am in love with this, but, I am having some math problems at the center/back portion. If the base is 56, and you mark 15st on each side, you are only left with 26 stitches. This has you starting in the 15th marker on the right, going 27st, adding one in the other marker... I am not good at math! Admittedly. Can you explain? Thanks! Could thou tell me if the increases on the front. Pieces near the shoulders are on the ends towards the outsides or to the middle? I'm left handed so sometimes trying to reverse directions throws Mr offs. Thanks! Hi Debbie! They should be on the outside while you work, then the inside when you fold the fronts in. Hope that helps! Watch the video, it helped me.. I am on love with this, but, I am having some math problems at the center/back portion. If the base is 56, and you mark 15st on each side, you are only left with 26 stitches. This has you starting in the 15th marker on the right, going 27st, adding on in the marker... I am not good at math! Admittedly. Can you explain? Thanks! Hi Ann! I just responded to your email. Thank you! I absolutely love this pattern! 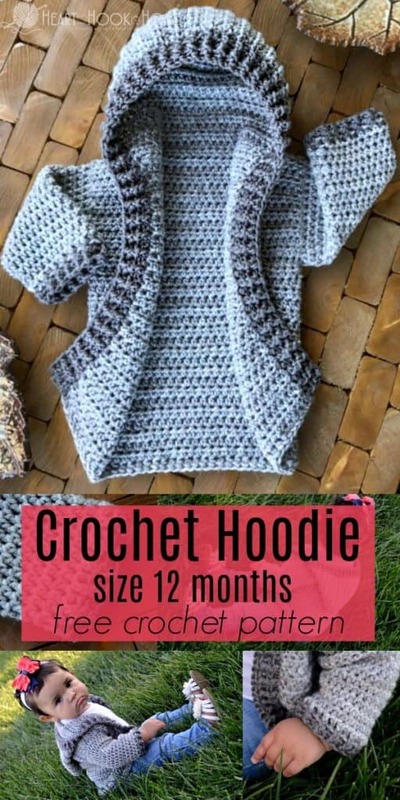 However, I just made the 6 month for a coworker and it is more like a 3-4 month size?? 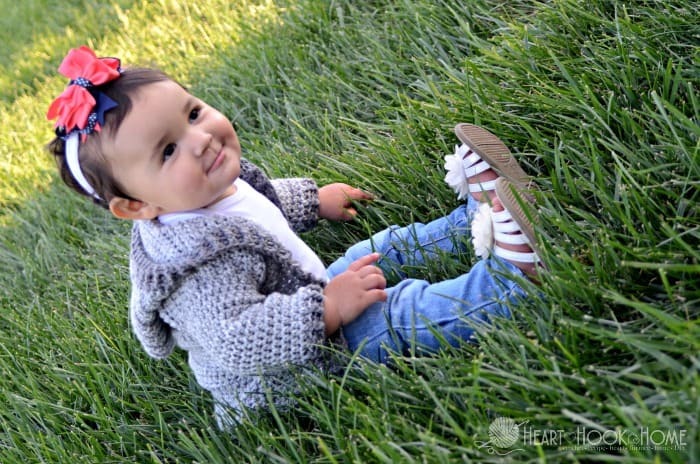 I dont want to go all the way up to a 12 month because her granddaughter really is a small little thing. Do you think going up to a K hook will remedy the problem? It doesn't fit around her and the sleeves are too short. I can fix the sleeves part by a more rows there but not sure if you think a K hook will be too open with a 4 weight yarn. Oh man! Did you do the gauge swatch? You could definitely go up a hook size though, and that will help! I did the swatch but I think my problem is, even though the yarn said it was a size 4, it's a thin sleek size 4. I'm going to make a toddler 2-4 today with red heart and see how that works up. Still love the pattern! Thank you! I just made a size 2/3toddler in this. My grandbabes is 20 months she’s very tall but very thin! I went down a size in hook to a size I. It came out perfect! Love it!! And the pattern was easy to follow and well explained. I can’t wait to make one for me next! And another for her! Hi I got switched around, do the increases on the left and right panels go on the inside or the outside? Hi Megan! They should point to the outsides, but if they point in its not the end of the world either. The stitch count is more important. Hope that helps! 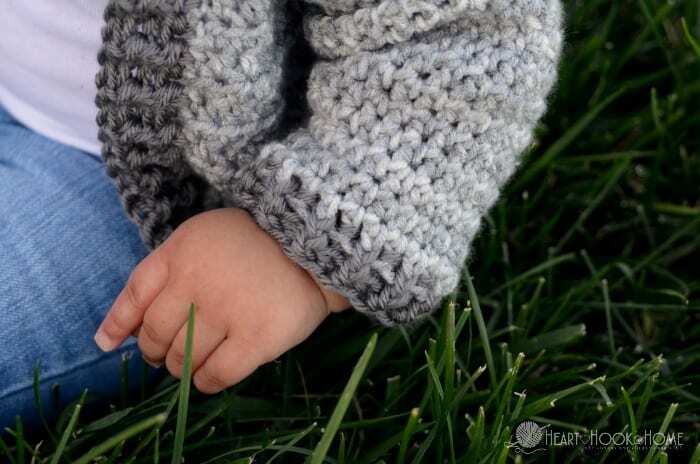 I would like to make the 12 month size with Bernat Baby Sparkle which is a 3 yarn. Should I use a different sized hook? I'd love to print this and sit down with the paper, but it isn't free on Ravelry anymore. Is it supposed to be? Am I missing something? Front post half double crochet & back post half double crochet. I just purchased this pattern but don't know how to view it! Can it be sent to me in email form? Alesha, I just finished the 12 month size cardigan in shades of beige and brown with Bernat Pop. The cardigan is cute and cuddly. 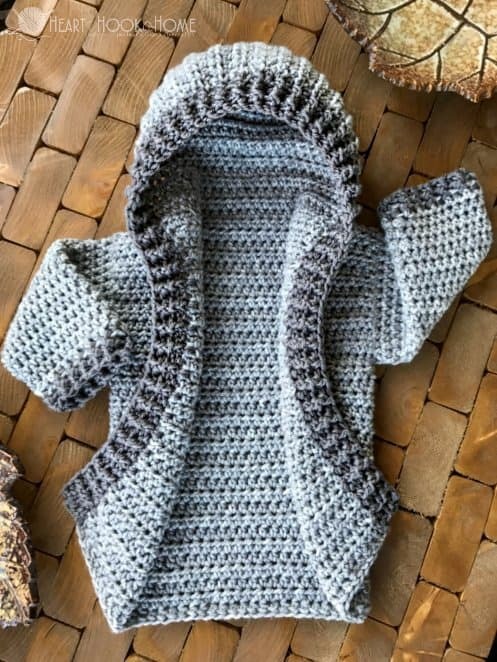 I will be adding a simple clasp closure so the cardigan will stay put on my granddaughter this winter. Thank you for making it available for free in so many sizes. Your work is an inspiration to crocheters: attractive and easy to follow directions. 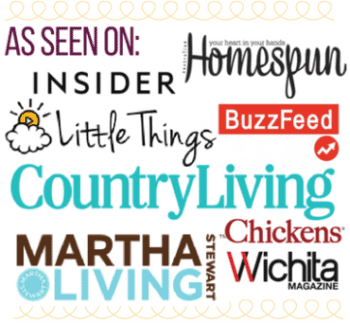 I am also at Pinterest at lilcreates. I'm so confused on the shoulders. Can you help? Is there a video for this pattern! Loving the pattern! I just have a quick question though, I noticed the Lion brand mandala yarn is a double knit instead of a Worsted Weight. So my guage is way off. Would you be able to tell me how to remedy this? I'm getting "2,1/2 instead of 4. Hi Alannah! You could go up to the 4/5t size if you want to continue with the Mandala. I bet that would do it! You could make it a bit shorter and add buttons. I bet that would be adorable! Thank you Charri! I'm so glad! 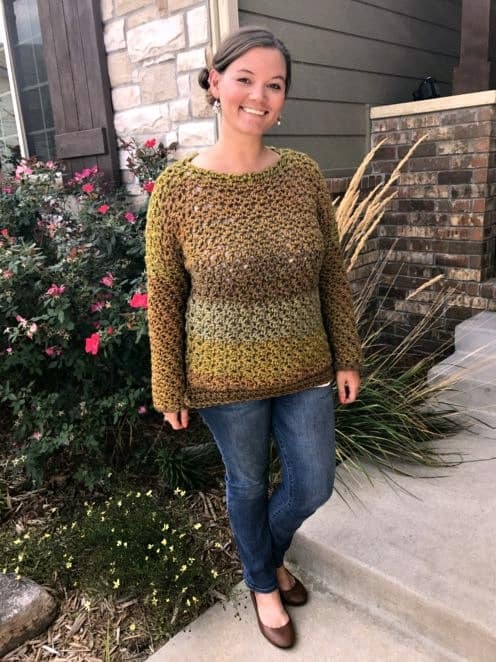 Thank you for working on and posting this pattern in size 12 months. I am going to start on it right away. You are welcome! Keep me posted on how it goes!